When consuming catechin you actually consume all the tea leaves crushed into a fine powder. Scientific testing in Japan has indicated that because of this, the antioxidant benefit of matcha can be up to 5-9 greater then with normal green tea consumed in the conventional manner. Our Catechin product is is produced to enhance the catechin level even further. Character: High level of tannins give this tea a decidely more astringent taste. A specially produced health blend for those who need to maximize their intake of the active ingredient in green tea: Catechin and/or to deal with specific health conditions. 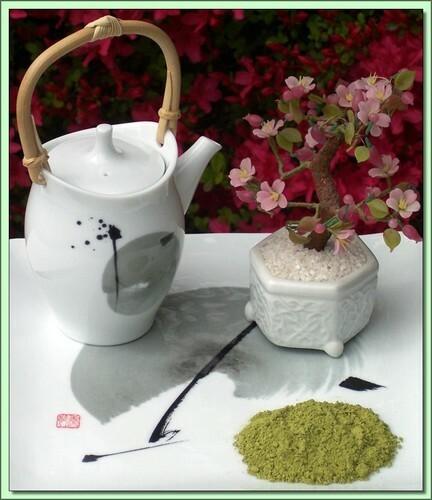 Green Tea contains four main catechin substances: EC, ECg, EGC and EGCg. Tannin in green tea is mostly catechin and forms a key component of its actual astringent taste. This is a strong tea. A 40g bag should make 20-25 cups (e.g half a teaspoon per cup). Research shows Catechin and polyphenols to be powerful anti-allergens. Because this Catechin powder tea consists of stone ground leaves it contains, by volume, higher concentrations of catechins, vitamins and L-theanine which is linked to increased alpha brain wave production and is considered a natural antidepressant, stress reliever and energy booster. Produced under ISO 14001 Certified Environmental Management Standards. Hot Tea: This tea is best enjoyed by pouring 200F/90C boiling water over the matcha powder (2/3-1 teaspoons per cup) for 30 seconds (longer=stronger). Important: While green tea is known for anti-allergic properties, in a small minority of individuals, high doses of catechin may cause allergic reactions. Consult a physician before drinking if you have allergies to catechin-rich foods like red wine, dark chocolate (cocoa), cherries, apples & cranberries. This is a concentrated fresh catechin product."